Q: 1. Who is the author of the software available to download on this web site? A: Every software product available for downloading on this website was designed and coded by a trusted team of developers lead by Dennis A. Babkin. For authenticity and to provide better trust for our users we code-sign our executable files with the Dennis' personal digital certificate. To check authenticity of any of our executable file, right-click it (.exe, .msi or .dll files only) and go to its Properties. 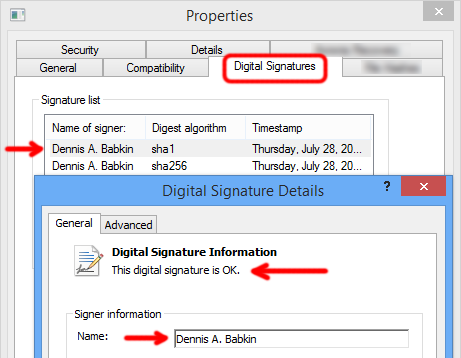 Then switch to Digital Signatures, and make sure that the signer (or publisher) on the certificate is Dennis A. Babkin. Then highlight it, click "Details" and make sure that "Digital Signature Information" is shown as "This digital signature is OK."
This is how you can make sure that the software is genuine, that it was not tampered with and that it came unaltered from our developers. We always stand by all of our signed files. In case an exectuble file that "claims" to have been downloaded from our site does not pass any of the steps of the digital signature verification outlined above, DO NOT run that file and notify us about it! Q: 2. What is the experience of the authors of the software? Q: 3. Can I open the source code files if I don't have Microsoft Visual Studio .NET 2002 or later? A: You will be able to open source code files even in a Notepad, but you won't be able to compile them into an executable file to test. Besides that you won't be able to view dialog boxes layouts and some other resources included in the Microsoft Visual C++ solution supplied in source code package. But, if you have a later version of the Microsoft Visual Studio you will be able to convert the source code files without any distortion. Q: 4. Is this software compatible with Microsoft Windows Vista? A: No. And, here is why. We were ardent supporters of Microsoft and their operating systems. The release of Windows XP was one of the best events that happened on the market of home computers. That operating system was most reliable and easy to use (for everyone: home/office users and programmers). All that changed with the release of Vista. I don't know what part of their bodies the execs at Microsoft actually used to make a decision to change the Windows operating system the way they did in Vista - let people be their judge. I cannot imagine how much Microsoft and Bill Gates must dislike millions of programmers that were using their OS every day to issue something like that. After buying the Windows Vista and installing it you will discover that almost half of your perfectly working hardware is not supported by it, and even if you buy it with a new computer, more than half of the software you bought before will not run on it. So think about it before you decide to convert from Windows XP. Our decision was not to go with the flow and totally renounce that monstrous release from Microsoft. As the bottom line we'd like to encourage computer users to switch to Macs. Microsoft Windows Vista made me buy Apple's MacBook Pro and I love it! Read more here. To ask your own question: Please use our feedback page.